The ultimate goal of this work is to prove that rapid experimentation can be used as a tool to translate the design objectives established by tropical plants, or other biological analogues, into innovative building assemblies. These experiments serve to question the role of the wall, making it a spatial, breathable element instead of a thin airtight membrane. 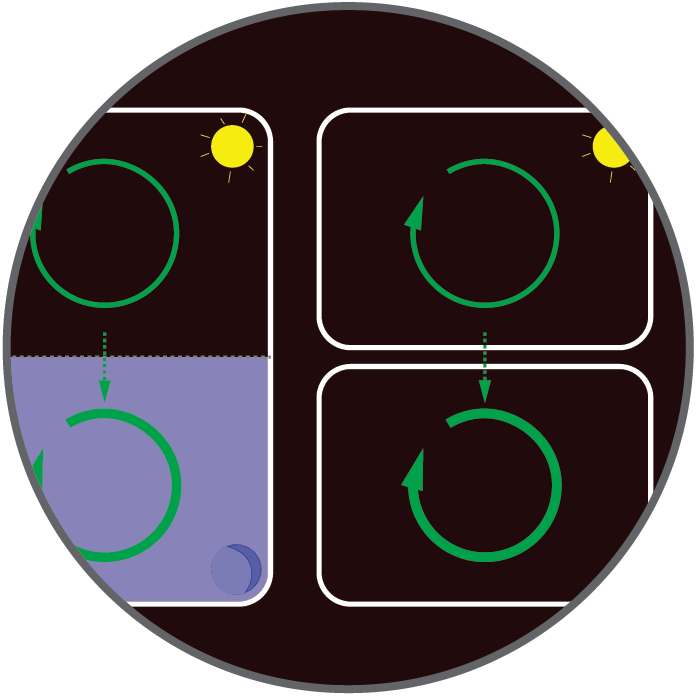 The three series of experiments, as shown by Figures 1-3, explore the architectural manifestation of the adaptive features found in tropical C4 plants – space, variability and storage. 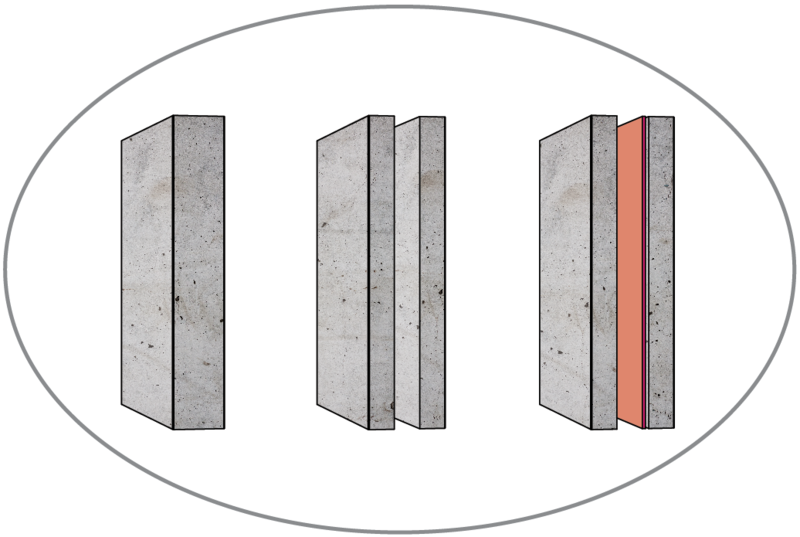 The first series of experiments, shown in Figure 1, test the same volume of concrete used in three different configurations to explore the effect of air space as a building material. Similar to the way the C4 plant splits metabolic activity between two different cell groups, this study explores heterogeneous wall assemblies. 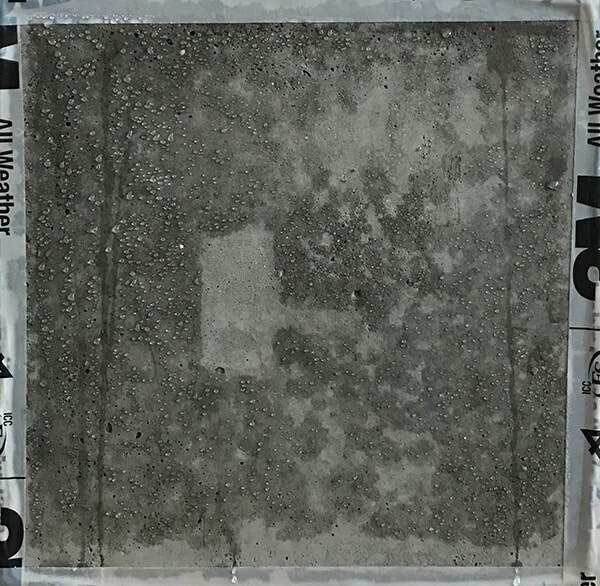 The second series of experiments, as shown in Figure 2, looks at a commercially available building membrane used in high-performance buildings, which claims to have changing characteristics depending on environmental conditions. This study asks how building materials can behave autonomously based on given environmental stimuli. 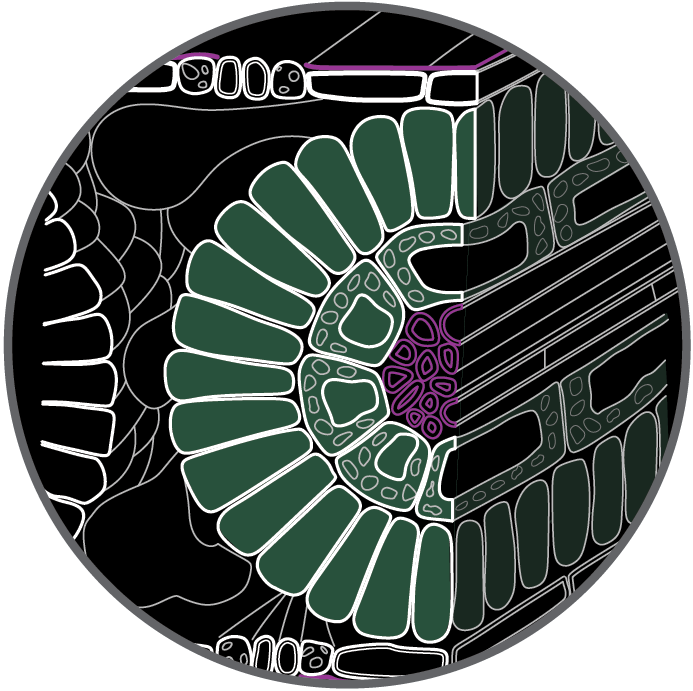 A plant may open and close its pores when environmental conditions warrant, but fully sealed buildings remain completely segregated from their environment. While the first two rounds of experiments measure the effect of various test specimens between the two chambers, the final series, shown in Figure 3, tests the ability of various materials to mitigate interior moisture conditions. By using materials with varying densities, it is possible to explore their moisture buffering potential in an interior space. Similar to the diurnal rhythms in the C4 plant, the materials can absorb and release moisture based on the ambient demands of the interior environment. Using conventional materials and known building science concepts, these studies are used to define a methodology for experimentally designing biologically inspired façade systems in tropical climates. Air layers can be used in building facades to obstruct heat flow as air has a low value of thermal conductivity and low density (Yin et. al., 1978). However, for air to work as an insulator in this capacity, it must remain completely motionless, without any convective heat transfer. Though the aspect ratio of the cavity is important to consider, the wall will actually create small convective pockets within the cavity that prevent heat from rising, unless a significant pressure differential is present. The first test is conducted with a 2” concrete panel (Figure 4a), the second with two 1” panels separated by a 1” of air space (Figure 4b) and the third again with two 1” panels separated by a 1” air space, however this time with an aluminum plate against the cavity side of the interior panel (Figure 4c). All concrete panels were cast to 13x13” dimensions using Quickrete ready-to-use concrete mix which provides a uniformly blended mix of gravel, sand and Portland cement. Each sample was preconditioned to the same requirements outlined in the previous chapter. Observations included ambient temperature and relative humidity as well as surface temperature measurements of the specimen at both exterior and interior locations. Additionally, material weights were taken immediately before and after the experiment to measure how much moisture had been absorbed into the concrete during the four-hour period. 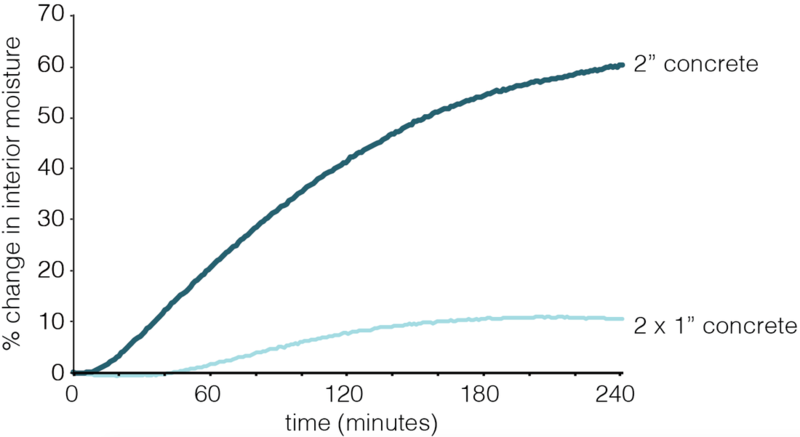 The 2” concrete sample increased nearly 60% from its original resting conditions moisture levels, as shown in Figure 5, while the same volume of material with a 1” airspace only allowed for a 10% increase over the four hours tested. In fact, the mass of moisture vapor in the interior chamber was 28% different between the 2” and 2 x 1” tests. Surprisingly, the addition of the metal panel had little effect on moisture transfer into the interior chamber. As a completely impermeable layer, it is expected that the material would block any and all moisture transfer. Unfortunately, this observation may be the result of lateral moisture transfer through the wood frame, even though special care was taken to moisture seal these conditions. ​Similar to the moisture conditions, the 2” panel saw an almost identical growth trend in temperature conditions. 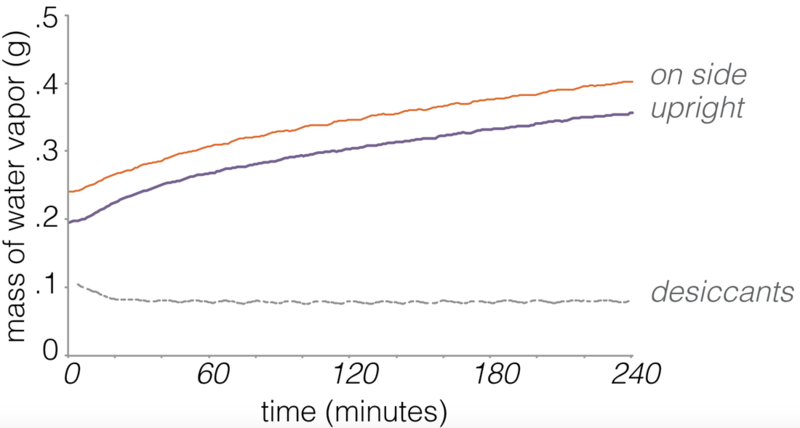 Within only four hours, interior conditions with this panel increased by 7.7°C while conditions within the 2 x 1” concrete sample test only increased by 3.6°C, showing a 4.1°C difference between the two conditions. For emphasis, this is a 4.1°C difference and 28% moisture reduction without changing the volume of the materials tested. As expected, the 2 x 1” concrete panels with the metal insert had a slight improvement in interior conditions, although not nearly as drastic as the addition of the air space. While the ambient conditions provided an interesting set of results, the most immediately notable difference between these three tests came from the presence of condensation on the panel faces. 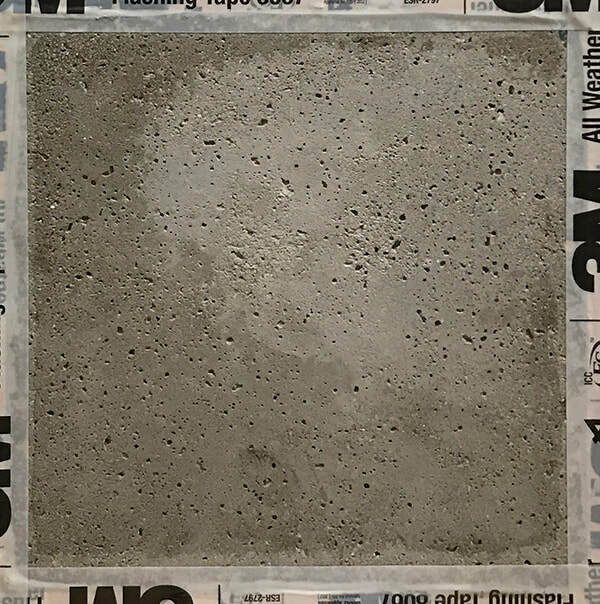 The two experiments, with the 2” concrete and the 2 x 1” panels, had a significant amount of condensation on the chamber side of the exterior panels (Figures 7, 8). For reference, the lighter colored shape in the center of the panel shows the location of the surface temperature sensor, which was attached with an impermeable clear tape. The experiment with the metal plate had only slight discoloration at the surface without any visible water drops, as shown in Figure 9. However, this panel seems to have absorbed the most moisture weight with +10 grams (.15% of initial weight) as compared to the other 1” panel that only absorbed +2 grams (.03%). The 2” panel which gained +14 grams, which was only .11% of its original weight. 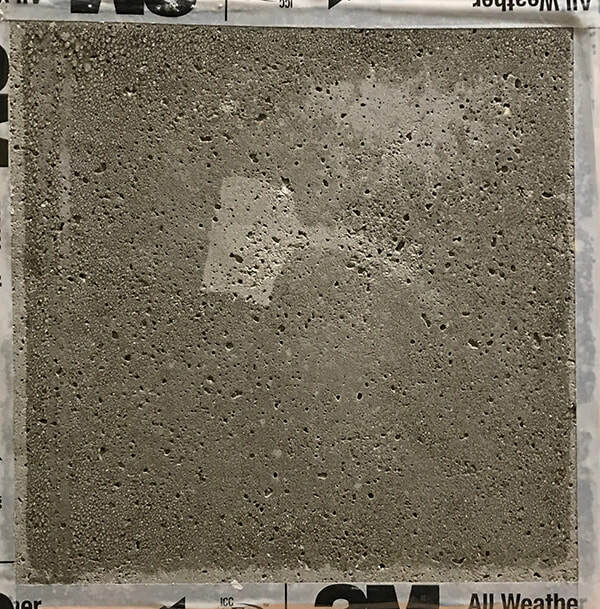 This suggests that the metal sheet helped drive moisture through the concrete, although the panel did not show any signs of condensation after the experiment was completed and the specimen was disassembled. ​The metal seems to have served two purposes here. First, it drew moisture through the exterior slab towards the cavity. 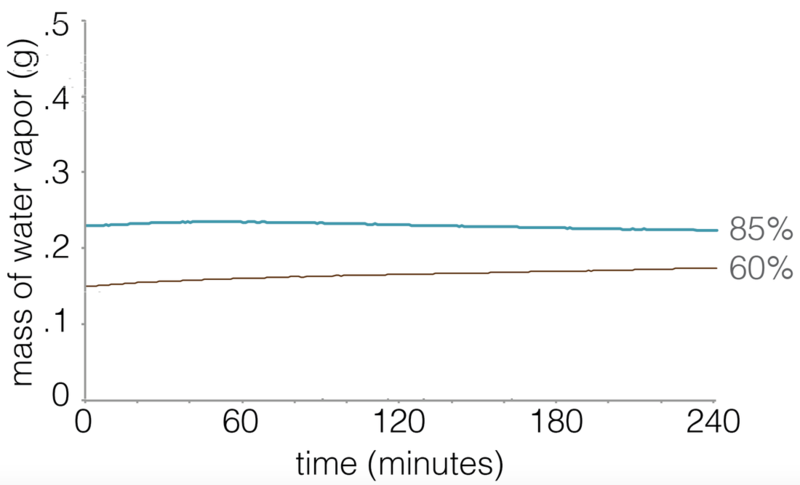 In fact, it seems to have even pulled moisture from the interior panel as well, which lost 4 grams of weight, even though moisture conditions in the interior chamber rose by 12.5% during the four-hour experiment. Obviously, moisture pressure was greatest in the exterior chamber so the natural direction of vapor drive would have been from exterior to interior. However, moisture from both panels moved inward toward the cavity in the direction of the metal plate. The interior panel of the experiment without the metal plate did not have any measurable change in weight. These weight changes can be seen in Table 1. ​​Condensation occurs once surface temperature falls below the dew point, which changes based on temperature, pressure and relative humidity conditions. As humidity within a space goes up, so will the dew point. When condensation forms, energy is released as the water changes phase from vapor to liquid. 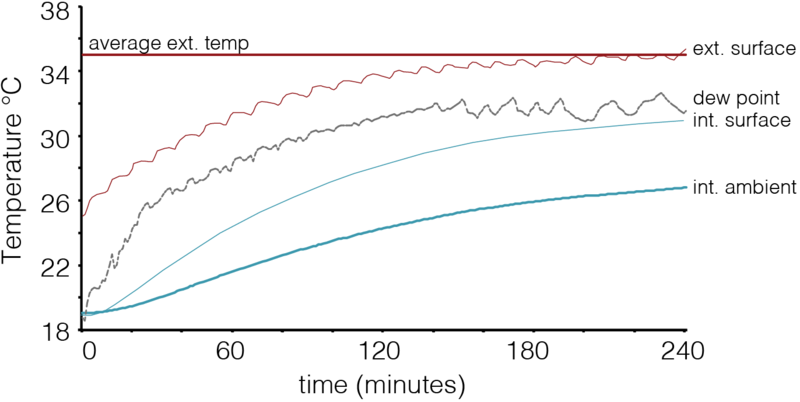 Figures 10-12 show the ambient temperatures of each chamber next to surface temperature conditions of the specimen. The HOBO sensor provided the dew points within the exterior chamber, which are also expressed on these graphs. 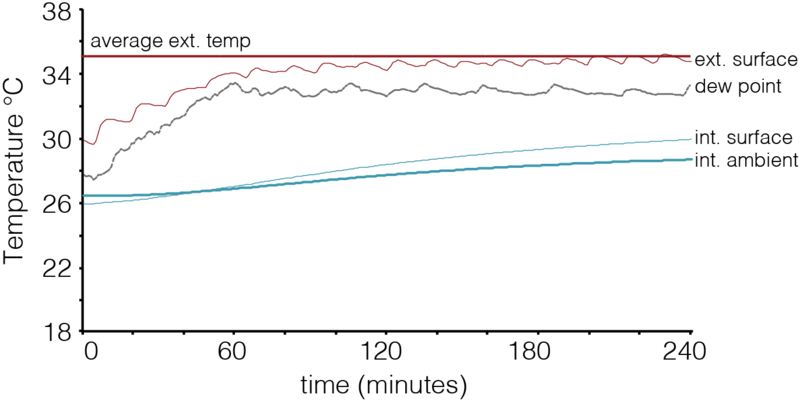 This figure shows that the exterior surface temperature never dipped below the dew points, which means that the condensation likely occurred during the initial startup period of the humidifier where interior conditions were not yet fully mixed. The dew points of the interior surfaces are not shown here as they were much lower than the extents of the graph, suggesting that it is unlikely to get condensation on the interior panels in these experiments. The results of these experiments clearly show that static air space can be used as a significant deterrent of heat and moisture transfer through an assembly. All three of these experiments used the same volume of concrete but had notably different interior conditions. Furthermore, these experiments suggest that metal panel (or other highly conductive surfaces) can be used to promote the dew point within the cavity and direct vapor drive. However, this has the potential to contribute a significant amount of water within the wall, something that building scientists have tried to avoid for decades due to potential for material instability and biological growth. As inspired by the C4 plant, which separates metabolic activity between cells to prevent the unfavorable transfer of undesired nutrients, these experiments explore the prospect of spatially separating building materials to create an observable effect of interior conditions. Air barriers and vapor retarders are used in conventional building assemblies to control vapor diffusion through the wall. Typically, the vapor barrier is on the hot side of the enclosure, meaning the exterior side in tropical climates. However, an emerging network of products is appearing that claims to have directional or variable control over vapor movement. Increasingly, smart is a term used to describe these emerging materials and technologies that control air and vapor flow through an assembly. With the term being used so liberally, however, it is nearly impossible to create a precise definition of what it actually means. 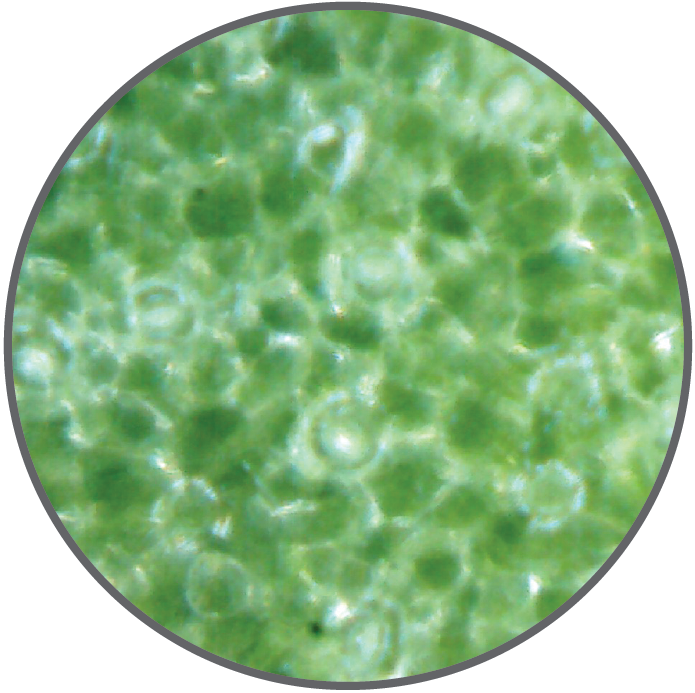 However, a plant controls its internal heat and moisture levels by opening and closing its stomata, the small pores on its membrane. Stomatal closure is driven by the circadian rhythms of the plant as well as environmental stimuli. This round of experiments explores the qualities and characteristics of a ‘smart’ building membrane that claims to have dramatically different characteristics at varying relative humidity conditions. The product selected for these experiments is ProClima’s INTELLO Plus membrane, which claims to have “intelligent vapor retarding properties” (475 High Performance Building Supply 2013). Most commonly used in small-scale, wood framed building applications in temperate climates, the membrane is used to prevent condensation in enclosed assemblies during winter months but allow for vapor diffusion in the summer, preventing moisture related damages in the building assembly. In fact, the most unique quality of this material is that it goes from a class II vapor retarder (<.13 Perms) in winter conditions to vapor permeable (13.20 Perms) in the summer. Though the manufacturer is clear to state that the membrane is not directional in that vapor still moves in the direction of lower vapor pressure, but it does stop diffusion given a certain environmental stimulus. Similar to the plant membrane, moisture is only allowed to pass through this variable layer when environmental conditions warrant it. 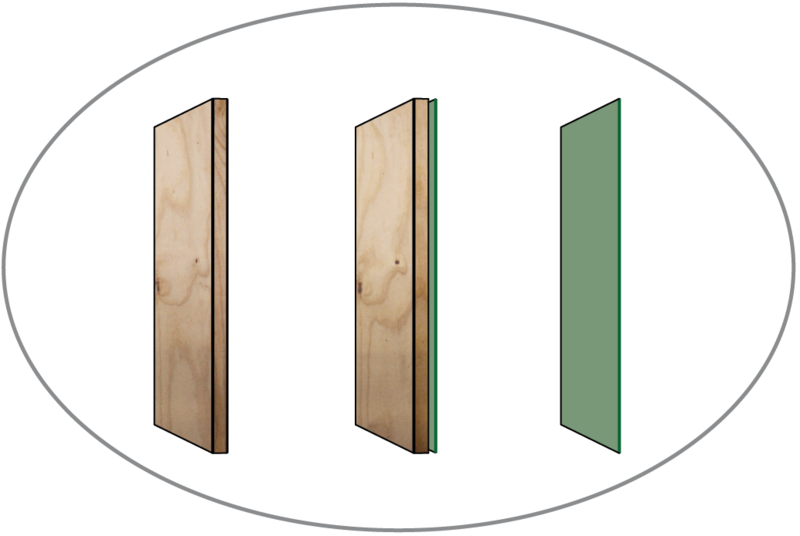 The proceeding series of experiments test three material samples – plywood, plywood + membrane, and membrane alone, as shown in Figure 13. While the temperature conditions remain the same throughout, each sample is tested at two different humidity conditions to test the variable nature of the smart membrane and to see its impact on interior conditions. Three experiments are conducted at 35C and 85% RH. These experiments are then repeated at the same temperature but at 60% RH. The first run tests the plywood on its own (Figure 13a), followed by the membrane layered over a sheet of 1/2” plywood (Figure 13b), and finally the membrane on its own (always with the text facing the interior box, per manufacturer guidelines) (Figure 13c). Each sheet of plywood is allowed to dry and reacclimatize to ambient conditions before it is used again. Each test runs for four hours following the aforementioned preconditioning period. Per usual, each test runs for four hours after the chambers have been preconditioned. When the tests were conducted in 85% relative humidity, as shown in Figure 14, it is clear that the plywood is doing most of the vapor retarding, as the test with both the membrane and plywood is only slightly different from the performance of the plywood on its own. The test with only the membrane allowed the most moisture to enter the box, showing that it was quite permeable. The membrane also showed the cycling of the heater, as the thin layer has very low thermal resistance. 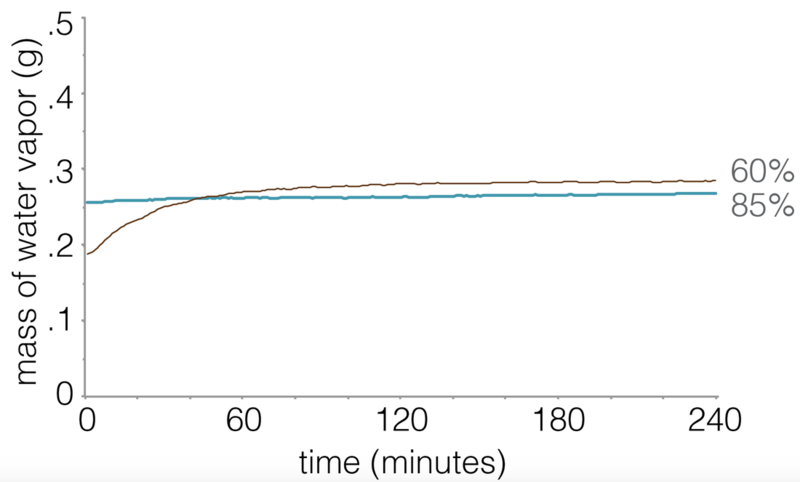 In the experiments with 60% relative humidity in the hotbox (Figure 15), the plywood on its own allowed for the most moisture penetration. While the membrane on its own performed better than the sole sheet of plywood, the combination of the two showed the best results. These comparisons are shown more clearly in Figures 16-18, which compare the performance by material. 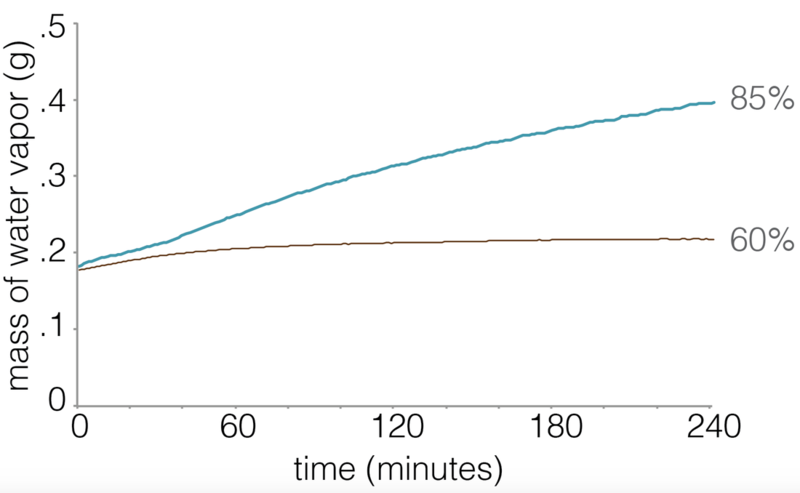 This figure especially shows that the membrane had a significant difference at the two conditions while the plywood performed similarly at both conditions, although a longer experiment might reveal changing qualities once the plywood became saturated with moisture. Validating the manufacturer advertising, the INTELLO Plus membrane did have noticeably different characteristics under varying environmental conditions. The plywood, as expected, remained relatively constant across both conditions during the four-hour experiment time. By knowing the innate properties of a material, this research proves that it is possible to provide variable vapor drive through a building assembly. While the variable layer used in these experiments was in the form of a sheet membrane applied to one side of the assembly, the author hypothesizes that the variable characteristics found in the membrane can be applied to the assembly as a whole. Like plants with variable permeabilities, the proposed wall can behave as an impenetrable wall when conditions dictate, however, it should also be able to open up when conditions are more favorable. Learning from the characteristics found in ‘smart’ membranes as well as the qualities of a plant leaf, the author hypothesizes that it is possible to create an air and vapor variable assembly as well. Using experimentation, it is possible to understand variable vapor drive through building materials. Permeance, the inverse of vapor resistance is a common metric of building materials and is typically measured in Perms (grains/inHgft2hr). However, it is less widely recognized that many materials have different levels of permeance under varying environmental conditions, and these characteristics can be of benefit to interior thermal comfort in unconditioned buildings. While material permeability is of particular importance in façade design, it is often ignored as a feature of interior building materials, which can play a significant role in interior moisture control. In fact, an emerging body of research shows that absorptive materials, such as wood (Lozhechnikova et al. 2015), interior surfaces, furniture, and finishes can be used to dampen humidity variations (Cerolini et al. 2009), potentially reducing heating and cooling energy consumption by up to 30% (Osanyintola and Simonson 2006). The concept described above, known as moisture buffering, refers to a material’s ability to modulate interior humidity levels by absorbing and releasing moisture. Even when interior temperatures remain constant, a reduction in relative humidity can have a noticeable impact on thermal comfort, particularly in unconditioned buildings. Many tropical C4 plants store a portion of the metabolic activity in an intermediary medium (malic acid). When conditions warrant, this medium is then passed on to another location to continue the necessary photosynthetic processes. In these experiments, the author proposes using intermediary materials within an interior space to store and hold moisture until it is acceptable to release it. While many studies look toward novel technologies, such as phase change materials (PCM’s), it is important to note that conventional materials also have the potential to create observable change within an interior environment. 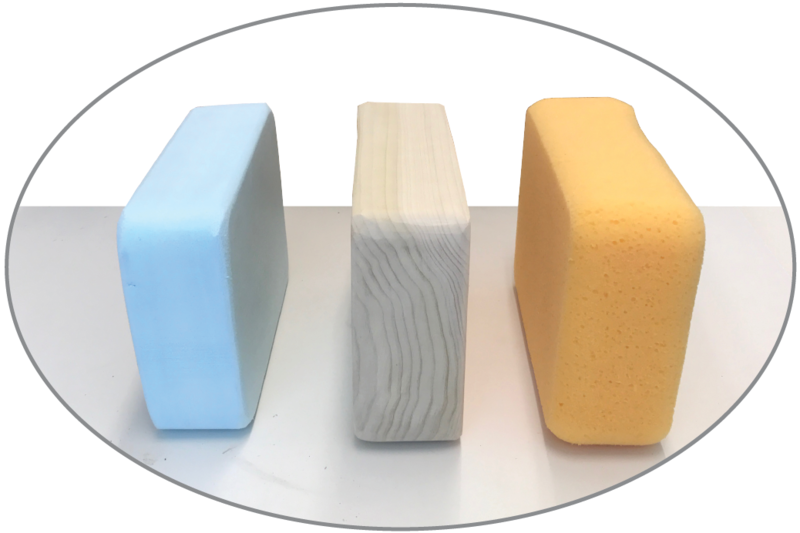 This research explores the absorptive qualities of three readily accessible materials: sponge, wood and foam, as shown in Figure 19. This series of experiments is slightly different from the first two in that it uses the same material as a barrier between the two chambers and the porous materials are used as intermediary materials that are placed within the interior chamber for each test. These materials, which have roughly the same volume and nominal dimensions, are tested individually. The sponge material is a commercially available grouting sponge made from estracell heavy-duty polyester, a non-organic material, shown in Figure 19c. The wood used is a Poplar, a dense hardwood that has low absorptive potential, shown in Figure 19b. Without getting the desired results within the experiment time, as will be discussed later, a much softer wood, Balsa, was added for comparison. For context, the average dried weights of the Poplar and Balsa are 29 lbs/ft3 (455 kg/m3) and 9 lbs/ft3 (150 kg/m3), respectively (The Wood Database 2017). The blue foam used is a solid piece of extruded polystyrene (XPS), which is traditionally used as a building insulation material due to its lightweight, hydrophobic properties and high insulation values (Figure 19a). It is a closed-cell product, meaning that the plastic insulation absorbs minimal amounts of water and the hydrophobic polystyrene polymer repels water from being absorbed into the material. However, the material has a number of small pockets and openings that the water may occupy without impacting the material, especially at the cut edges. In response, the foam was ‘sealed’ with an artist’s sealant, ModPodge, to prevent any moisture penetration. The material was tested in both its sealed and unsealed states, which will be discussed later. All materials were preconditioned in the same room for several days before testing. All experiments in this study again use ProClima’s INTELLO Plus membrane between the two chambers. As discussed in the previous section, the membrane is a sophisticated material used in high performance buildings in temperate climates. However, it is used here because of its high level of permeability (at the set conditions) and low thermal resistance. Given the compressed experiment time, this allows results to appear quickly and definitively. After the preconditioning procedures outlined in the methodology, the specimen is placed in the center of the interior chamber, which is then sealed with the membrane and attached to the hotbox, which maintains the established design conditions of 35°C and 85% RH for four hours. To establish benchmarks for comparison, the results of these materials are compared against silica gel desiccants, a material less common in building applications but one that is regularly found in electronics packaging applications. A small pile of the packets are placed in the center of the interior chamber. The chamber is also tested in its empty state to establish the maximum moisture control line. 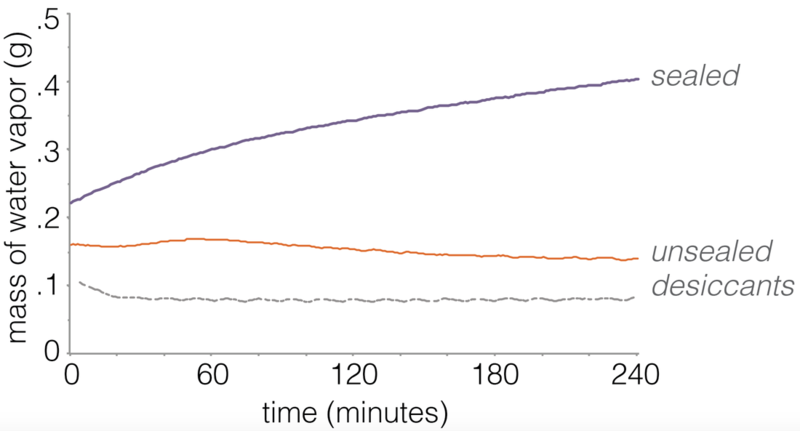 The results of these two experiments are used as controls and graphed with each dataset. The experiments were first conducted with each material on their sides (Figure 20), which exposed approximately 98 in2 (632 cm2) of clear surface area. To study the impact of surface area on moisture penetration, each material was retested in the upright position (Figure 21), which had an exposed surface area of 123 in2 (794 cm2). 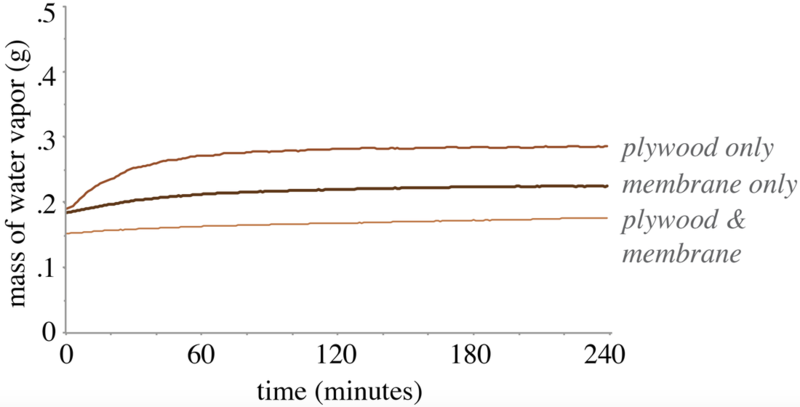 When tested with the sponge and wood specimens, the upright position provided for lower interior moisture levels, as shown by Figure 22, demonstrating that the increased surface area allowed for greater moisture penetration and enhanced moisture buffering potential. This observation would become increasingly obvious given longer testing conditions. The hardwood, for example, only began to show slight variation between the two orientations after approximately 2.5 hours. As shown by Figure 23, the density of the wood had a much greater impact on material performance than did orientation. Figure 24 shows a comparison of the foam in its original state (unsealed) and then after it was air sealed. The unsealed foam actually seems to have absorbed the most moisture of all the materials tested. With the original intent of comparing only a few materials, the following discussions regarding temperature, humidity and comfort refer to the sponge and wood in the upright orientation and the foam refers to the sealed condition, unless specifically noted otherwise. Both hardwood and softwood are used. 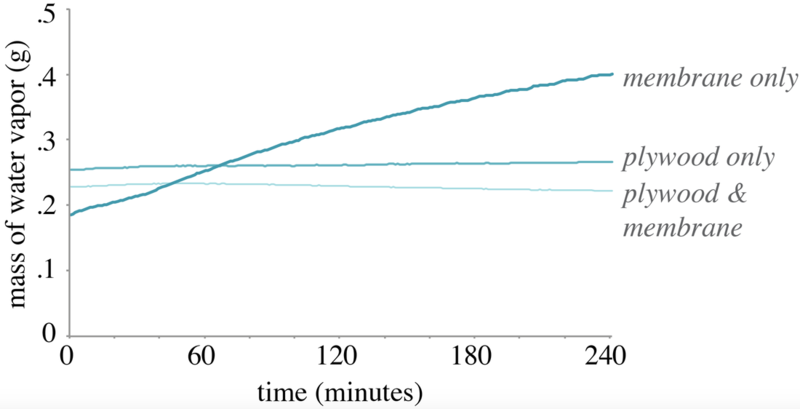 ​Figure 25 shows the percent change of water vapor mass within the interior box over each four-hour experiment. As expected, the empty chamber and desiccant experiments set the high and low controls, respectively. All other results fell within these extents. The materials with the least permeability, the foam and hardwood, had the smallest impact on the unconditioned interior space. The more porous materials, the softwood and the sponge, had the greatest impact on interior moisture levels. In fact, the sponge showed an 11% difference of interior moisture levels from the empty box on its own. 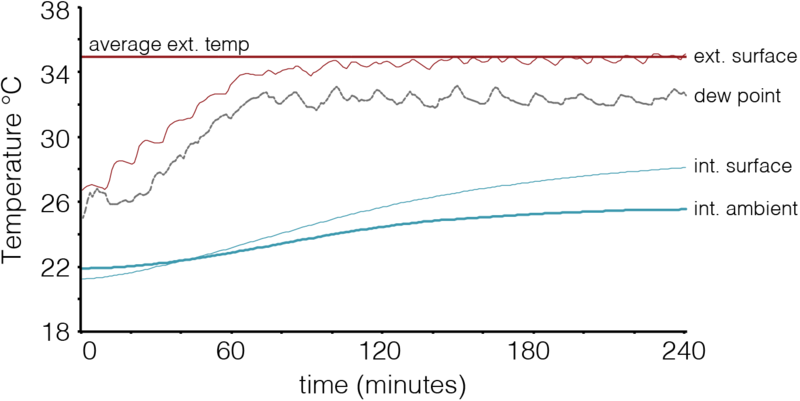 Ultimately, the different specimens had little effect on temperature within the interior box, as shown in Figure 26. 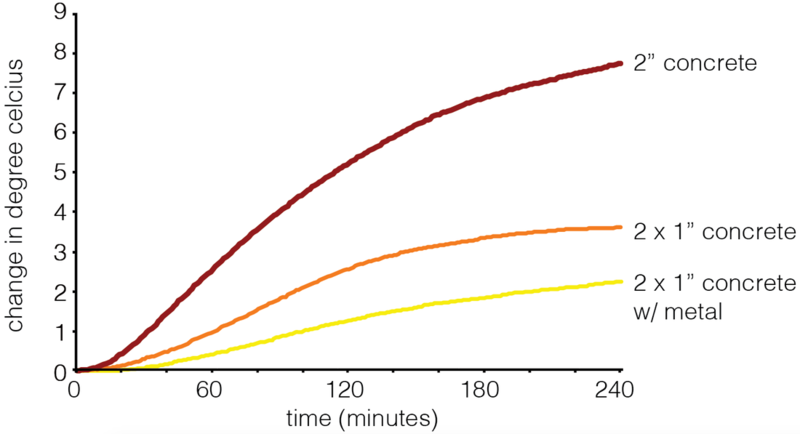 Once the hotbox reached equilibrium after about 60 minutes, each condition increased roughly at the same rate, showing that temperature was more controlled by the membrane than by the buffering ability of the specimen. In fact, the conditions of the interior box seem to have been driven more by ambient room conditions outside the testing chambers. The experiments with the highest interior temperatures, foam, hardwood (hw on side), hardwood (hw upright) and sponge, were also conducted on the four warmest days (as shown by Figure 27), suggesting that these results had little significance on this report. 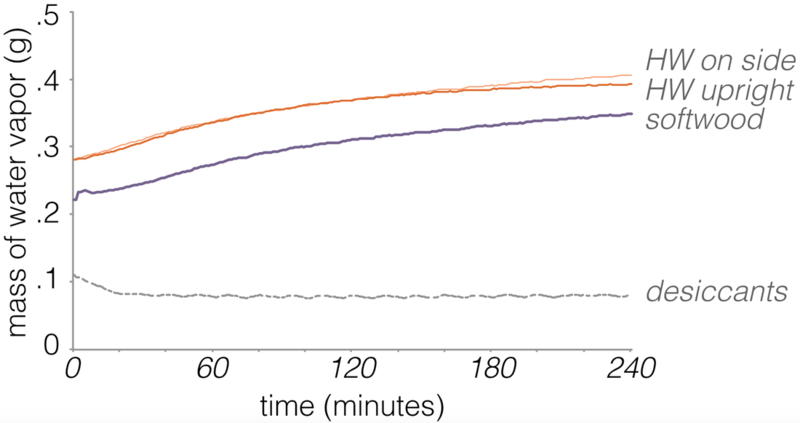 While temperature may have correlated with moisture buffering abilities of different materials in these experiments, it would have a noticeable impact on thermal comfort. Two important factors of moisture buffering potential are the materials potential to return to its original condition without creating dimensional instability and its ability to suppress conditions for biological growth. 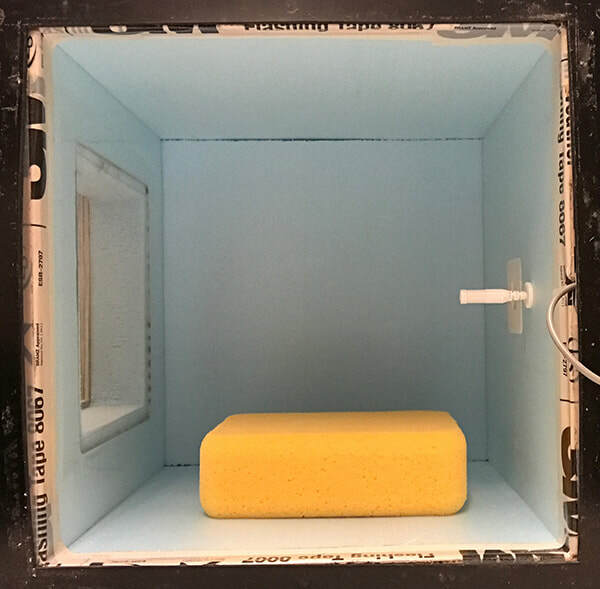 This research does not suggest that sponges be used in interior spaces to modulate swings in interior humidity conditions, rather, it identifies thresholds and methods for thinking about the absorptive potential of interior materials. Though some of the results have already been conceptually proven in the literature, this method gives the architect the ability to evaluate specific materials in a comparative fashion. Once conditions are established, this data could be used to supplement or enhance digital simulation methodologies that struggle to factor in the multi-dimensional effects of moisture, particularly in tropical climates. The materials and experiments used in this study show that more porous materials have a greater ability to modulate interior moisture swings. Integrated as dynamic systems, buildings could better react to fluctuating environmental conditions. As identified by multiple agencies, the tropics are rapidly urbanizing, however, modern building materials and styles have been developed well outside of these regions. Instead of adapting these foreign technologies into tropical climates, designers must first question the genesis of these inventions. In addition, designers must propose immediately implementable solutions that greatly reduce the need for energy intensive mechanical conditioning systems. This means the use of conventional building materials and technologies. Instead of relying on simulation, which often neglects many of the qualities of moisture in materials, this thesis proposes a small-scale hotbox apparatus that can be used to produce quick and definitive answers to even the most simple building science questions. Not only does this device rapidly and affordably test small material samples, it helps to articulate building science concepts in a tangible and understandable way, bringing thermodynamic principles into architectural discussions and out of the opaque domain of engineers and material scientists. The thesis culminates with a path for future work that proposes a vapor directional and entirely autonomous modular wall product that could potentially reduce or eliminate the demand for mechanical conditioning in tropical climates. Though the brick is suggested as a provocative discussed of future work, the scope of this thesis is about creating the translative means to achieving this end. By creating an interdisciplinary, iterative design approach that challenges hygrothermal phenomena of conventional materials, this thesis proposes new design methods that counter the adverse environmental consequences of sealed glass towers and mechanical conditioning. ​Cerolini, S., M. D’Orazio, C. Di Perna, and A. Stazi. 2009. “Moisture Buffering Capacity of Highly Absorbing Materials.” Energy and Buildings 41 (2): 164–68. Lozhechnikova, Alina, Katja Vahtikari, Mark Hughes, and Monika Österberg. 2015. “Toward Energy Efficiency through an Optimized Use of Wood: The Development of Natural Hydrophobic Coatings That Retain Moisture-Buffering Ability.” Energy and Buildings 105 (October): 37–42. Osanyintola, Olalekan F., and Carey J. Simonson. 2006. 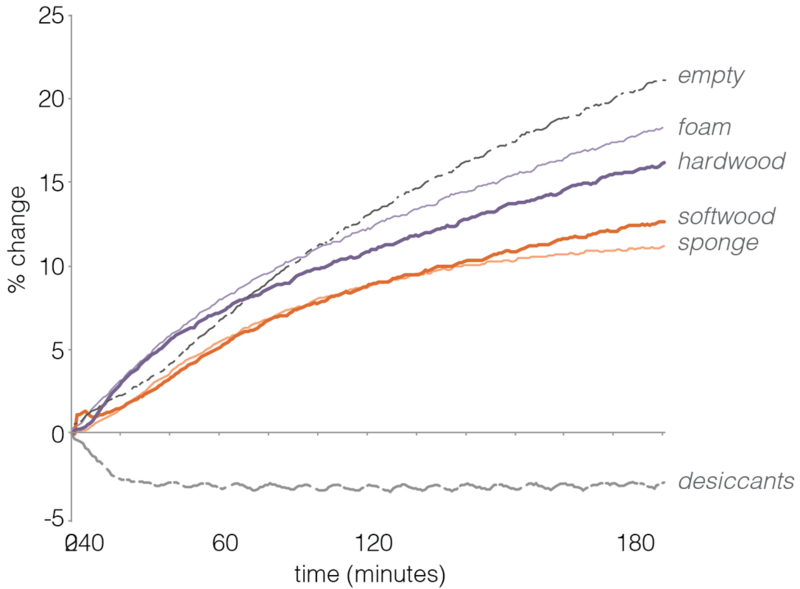 “Moisture Buffering Capacity of Hygroscopic Building Materials: Experimental Facilities and Energy Impact.” Energy and Buildings 38 (10): 1270–82. The Wood Database. 2017. “Lumber Identification.” Accessed May 10. http://www.wood-database.com/poplar/. Yin, S. H., T. Y. Wung, and K. Chen. 1978. “Natural Convection in an Air Layer Enclosed within Rectangular Cavities.” International Journal of Heat and Mass Transfer 21 (3): 307–15.